This is a large and small matching set of Bowie Knives. 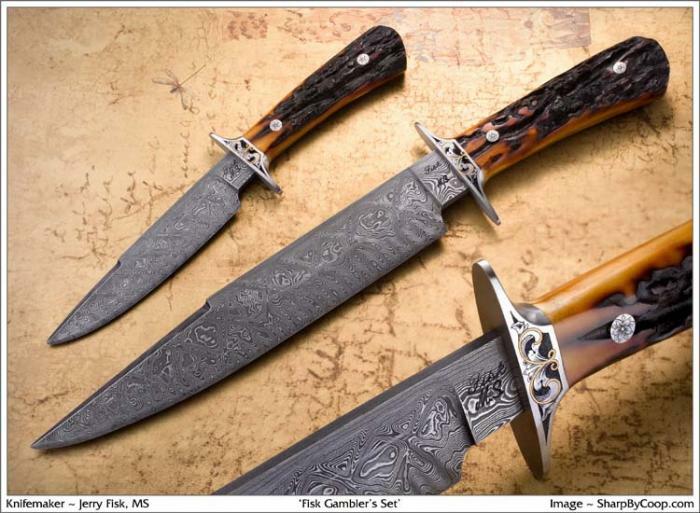 The large Bowie won Best Bowie knife of show at the Bladeshow. A matching set can be made to suit whatever purpose you have in mind, for gamblers that would use these to up-scale knives to carry into the sports field. Embellishments: Deep relief scroll Engraving on the guard and pins with 24kt gold inlay. The pins are engraved with flowers. To give an idea of how long it takes to engrave, each of the pin's flowers takes 84 cuts on these pins.